First time on stage. Christmas concert, Beth in the middle. The fellow on stage right learned how to bow. Beth's balloon won't float, but she's ok with that. 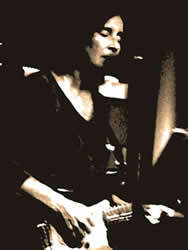 Beth Fitchet Wood is a singer, guitarist, composer and producer. Her main influences are in the folk, pop, musical theatre, jazz and rock ‘n roll genres. She was in the Southern California band "Honk" in the early seventies, who released three albums and toured nationally with Loggins and Messina, Chicago and the Beach Boys. After Honk, Beth played in just about every conceivable musical format, in most kinds of venues. She also toured the world as a background vocalist and assistant producer. In the 1980's, Beth recorded and co-produced two children's albums with her co-Honk members Will Brady and Steve Wood, her husband. These were recently re-released on her CD entitled "Autumn To May". She also recorded an album with her girls group "The Girls" in 1988 entitled "That's What Dreams are For". During the 1990's, she recorded an album with her guys group "Zero Ted" entitled "Sacred Cow", and her album "Silos", featuring 8 original songs, has the same cast of characters. She most recently recorded a CD of pop tunes and Honk favorites entitled "Angel On My Shoulder", with unique instrumentation. The basic tracks for that CD were recorded in Slovenia, with a string/accordion band! Beth will take just about any excuse to sing, and has been given many wonderful opportunities to do that, singing background on hundreds of albums, IMAX soundtracks and commercials. Since the turn of the millenium, Beth has accompanied her husband Steve on his worldwide production adventures for Sony Classical, striving to make herself useful at concerts he produced at the Colosseum in Rome, and Central Park in New York (with their son Nate! ), and has been fortunate to assist at recording sessions with some of the best new tenors of our time. In 2005, she was production assistant for Steve's Greek IMAX soundtrack, "Greece - Secrets Of The Past", which featured 5 of the biggest Greek recording stars. She also co-wrote the title track for the IMAX film “Hurricane On The Bayou”. Then she comes home to Laguna Beach, teaches music to her students, runs her Tuesday Night Songwriter's Showcase,plays live with her group "The Girls" and occasionally does concerts with her old pals in Honk. It has been suggested that I write a more thorough bio, ala the modern blog idea, so here goes: I was born in Port Washington New York and moved to Phoenix Arizona when I was 2. I grew up there, and as my parents embraced the heat and the horses and the desert, so did I. My mother and father loved music and were aspiring actors in musical comedy, so that was my first main musical influence, along with Burl Ives, the Sons of the Pioneers, Harry Belafonte and Mary Martin. In fact, they were my first heroes, along with Betty Crocker. 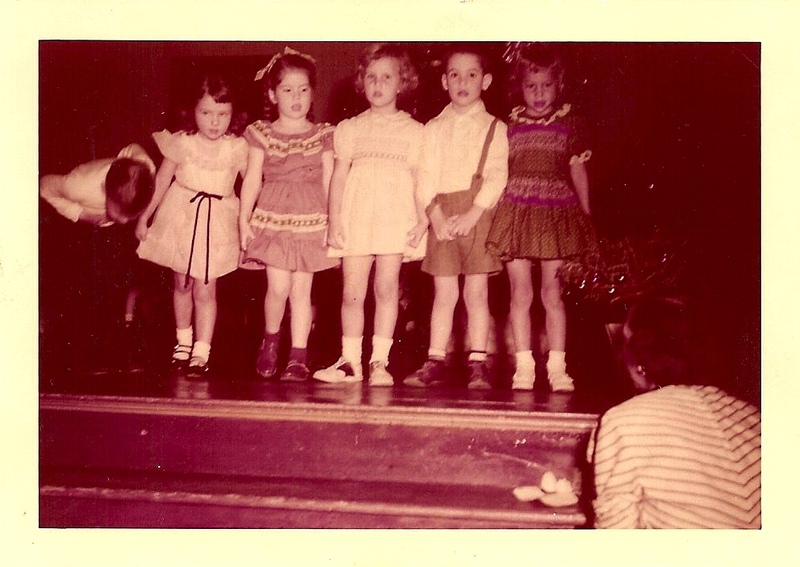 I always sang, and first appeared on stage when I was 3, singing "Somebody Bad Stole De Wedding Bell - a", a fine song. A lot of stuff happened in between, and when I was 14 I first heard the Beatles on the car radio riding to school with my brother Philip. Though I had always been pathologically shy, this event knocked me out so fiercely I burst into P.E. shouting about it. Life changing! At barely 15, I went to a party and my friend Jan let me try out her Gibson, properly tuned, and I fell onto a road I never fell back out of. Then, Mary Ann Jones lent me her Bob Dylan "Freewheelin'" album, and after thinking how weird and bad his voice sounded on "Blowin' In The Wind" that next song started, which was "Girl From The North Country", and I sobbed on the floor for the rest of the time. I don't know why I knew how good it was. Luck. I met some other musicians in Phoenix, Doug Haywood and Jeff Gilkinson, and we decided to work together and take Hollywood by storm. Doug was (is) a wonderful songwriter, guitarist, singer and bass player, and Jeff had (has) a strange conglomeration of talents, including playing telepathic harmonica, banjo and ripping cello. After a brief practice session in Washington, we all moved to Hollywood and started playing the various Hoot Nights. That was 1969, and Monday nights at the Troubadour were magic. About the first four or five Mondays, I first heard Jackson Browne, Longbranch and Pennywhistle (Glenn Fry and J.D. Souther), Carla and Lisa Bonoff, Penny Nichols, then Judee Sill and Tom Waits. Incredible to come across that music without warning. I'd stumbled into the motherlode. 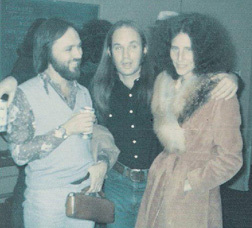 Our band played several times on Mondays, and thus developed a passing acquaintance with those people, which resulted in Doug landing a twenty year gig with Jackson Browne. I simply had to learn his songs and since the only way to do that in those days was to memorize like crazy and get busy with the bar napkins, that's what I did. I'd play those wonderful songs for anyone who would listen, including the folks at Criterion Music, a publishing house in Hollywood. They agreed that Jackson Browne's songs were very special but they didn't think his voice was so great, so they asked if I would sing some demos of his songs for them to shop. The Criterion folks thought the songs needed a little fleshing out musically too, so it was suggested that I team up with this new band to accompany me. The band was Honk. Strangely enough, I'd met Honk a few months before at a Hoot night at the Golden Bear in Huntington Beach. I'd seen that Jackson Browne had gotten a gig there, so I thought I'd try my luck too. It was another Monday night thing and Honk had just formed, and there were some other brand new acts, namely Cheech and Chong, and the Ice House Blues Band. Honk played fascinating music: My Analyst, by Lambert Hendricks and Ross, and some crazy original music, written by them and also by Mark Turnbull. They were extremely cute, especially the keyboard player. Woody. Surfer dude with long hair. Both Honk and I got the gig, for the same night. It was a strange pairing of acts; me, a skinny curly haired shy, introverted folksinger and Honk, a ripping rock and roll band with jazz roots and the happiest, most energetic attitude I'd ever come across. Somehow it worked very well.